The National Weather Service and EPA advise people to regularly check the UV Index, which they developed as a way to predict the next day’s UV radiation levels on a 1-11+ scale, helping people determine appropriate sun-protective behaviors. EPA will issue a UV Alert when the level of solar UV radiation is predicted to be unusually high and the risk of overexposure is consequently greater. Also at the EPA site (www.epa.gov), you can check the UV Index forecast map, which shows contour lines of predicted UV Index values during the solar noon hour. The map is created daily from National Weather Service forecast data. Here are the recommended Sun Protective measures for each exposure category. easily, cover up and use sunscreen SPF 15+. In winter, reflections off snow can nearly double UV strength. intense UV radiation by seeking shade during midday hours. Very High (8-10) Protection against sun damage is needed. If you need to be outside during midday hours between 10 a.m. and 4 p.m., take steps to reduce sun exposure. A shirt, hat and sunscreen are a must, and be sure you seek shade. Beach-goers should know that white sand and other bright surfaces reflect UV and can double UV exposure. Extreme (11+) Protection against sun damage is needed. If you need to be outside during midday hours between 10 a.m. and 4 p.m., take steps to reduce sun exposure. A shirt, hat and sunscreen are a must, and be sure you seek shade.Beachgoers should know that white sand and other bright surfaces reflect UV and can double UV exposure. Regardless of the UV Index, the following sun safety measures are encouraged:· Do Not Burn.· Generously Apply Sunscreen to all exposed skin using a Sun protection Factor (SPF) of at least 15 that provides broad-spectrum protection from both ultraviolet A (UVA) and ultraviolet B (UVB) rays. Re-apply every two hours, even on cloudy days, and after swimming or sweating.· Wear Protective Clothing, such as a long-sleeved shirt, pants, a wide-brimmed hat and sunglasses, where possible. · Seek Shade when appropriate, remembering that the sun’s UV rays are strongest between 10 a.m. and 4 p.m.
· Use Extra Caution near Water, Snow and Sand as they reflect the damaging rays of the sun which can increase your chance of sunburn. · Watch for the UV Index (See chart above). · Get Vitamin D Safely through a diet that includes vitamin supplements. Early detection of melanoma can save your life. Carefully examine ALL of your skin once a month. A new or changing mole should be evaluated by a dermatologist. 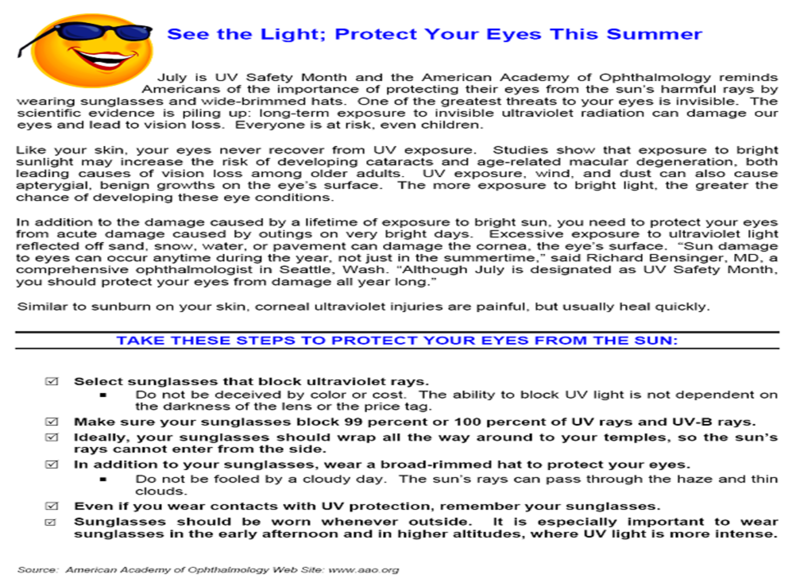 Have fun in the sun this summer, but remember to use all the UV protection possible.